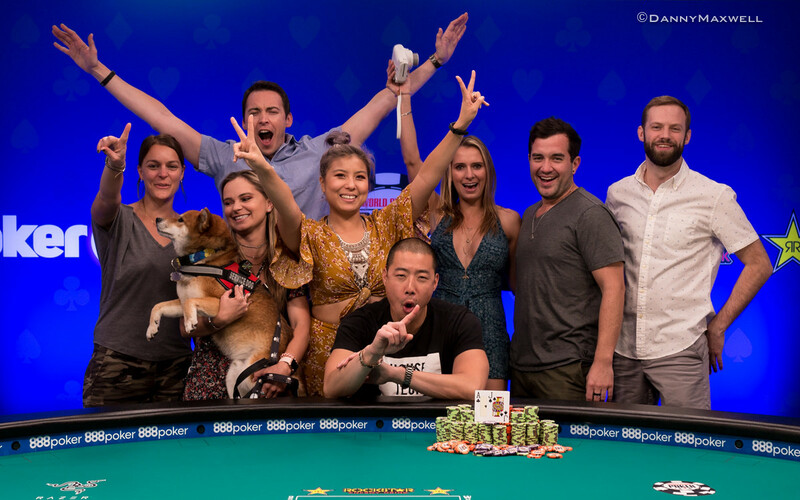 After four days of play, Benjamin Moon can call himself the first ever winner of the $1,500 Big Blind Antes Tournament at the World Series of Poker. 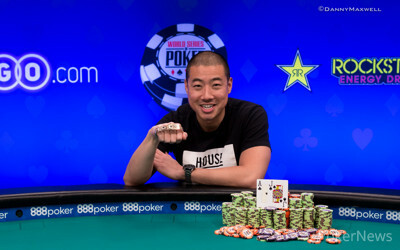 Moon got to take home his first ever gold WSOP bracelet and $315,346 for finishing in first place out of 1,306 total entries. 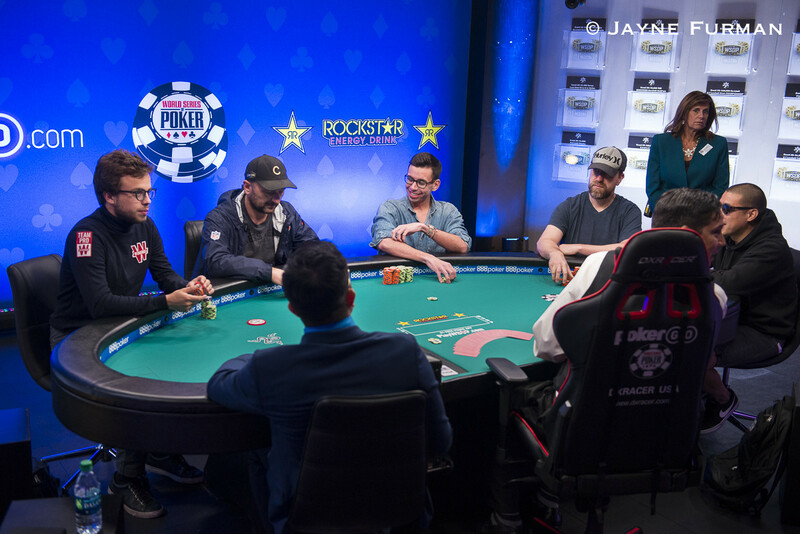 The final table started six-handed today with 28 hands being played yesterday to cut the number of players down from nine to six. The players still needed to play about 20 minutes of the level they finished in yesterday and nothing really happened until near the end of the second level of the day. Bohdan Slyvinskyi was first to say goodbye to the rest when he ran his ace-seven into the ace-queen of Colin Robinson in the 56th hand of the final table which was broadcasted on Twitch.TV, thanks to PokerCentral. Even though Nhathanh Nguyen doubled up through Moon at first, two hands later, Nguyen’s deep run was done for today when his king-jack couldn’t win against Moon’s ace-seven. Nguyen got to take home $73,242 for his efforts and his first ever recorded live tournament cash. It would then take another 30 minutes for Moon to add another victim to his list. Steven Snyder shoved his king-four into the ace-ten of Moon for less than six big blinds. Snyder picked up a straight draw on the turn but the river didn’t bring it for him. Only fifteen minutes later, Robinson’s run was over when he shoved with eight-five on the queen-four-six flop into the queen-six of Moon. Even though Robinson had a flush and straight draw, he couldn’t beat the two pair of Moon, even after the turn and river had been dealt. Romain Lewis had the loudest and biggest rail with all the French people coming over to the Brasilia stage to cheer him on for every pay jump he managed to grab. But in hand #91 of the final table, Lewis got it in with ace-deuce suited against the ace-jack of Moon. The four-nine-trey flop gave Lewis a straight draw, the eight on the turn added even more outs for Lewis as he now also had a flush draw. But eight of clubs on the river wasn’t any of the outs he needed and Lewis cashed in for $194,837 for finishing as the runner-up which surpasses his biggest live cash ever. Moon will be back tomorrow, Saturday, June 9th, for the bracelet ceremony which will take place around 2:40 p.m. local time on the same Brasilia stage where he has just won. 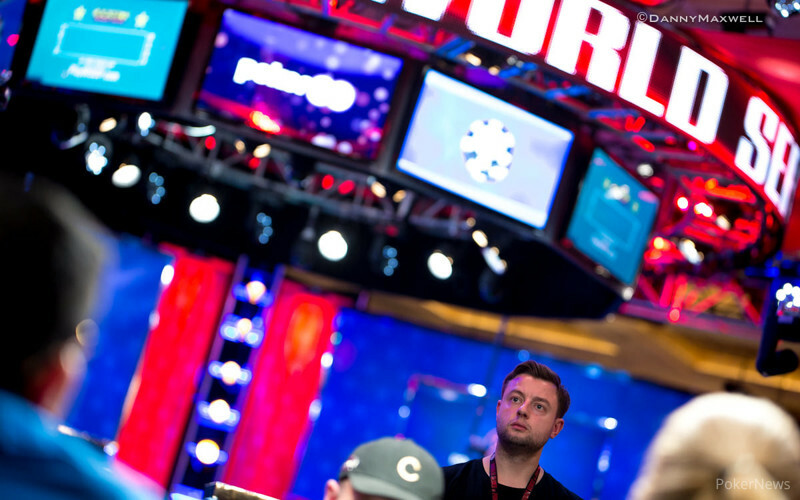 Keep following the PokerNews updates as the live reporting team will be here all summer to bring you all the action from the floor! Check out his Bracelet Ceremony with Sarah Herring. Hand #91: Benjamin Moon opened to 250,000 and called a three-bet jam from Romain Lewis to put the bracelet o the line. The board ran out and Moon faded both straight and flush draws to win Event #13: $1,500 Big Blind Antes No-Limit Hold'em for $315,346. 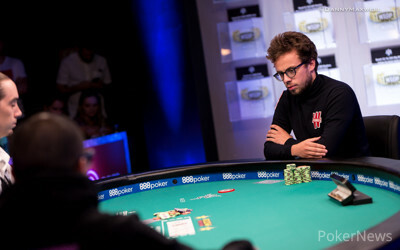 Lewis banked $194,837 for second place. 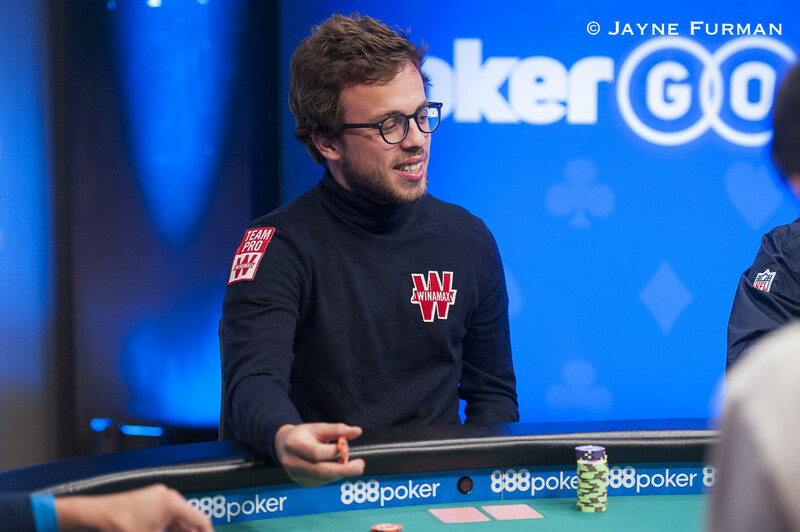 Hand #87: Benjamin Moon opened to 200,000 and Romain Lewis made the call. The flop fanned out and Lewis check-folded to a bet from Moon. Hand #88: Lewis opened to 325,000 and Moon folded. Hand #89: Moon limped and Lewis checked to see a flop. Moon bet and Lewis folded. The final two players have been sent on a 15-minute break. 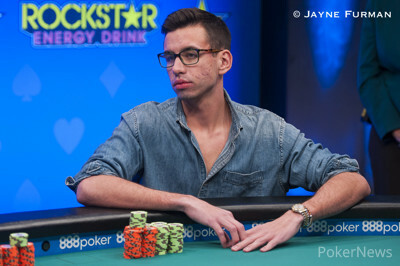 Hand #85: Benjamin Moon raised to 200,000 and Romain Lewis called. The flop came , Lewis checked, Moon bet 175,000. Lewis raised to 450,000 and Moon quickly folded. Hand #86: Lewis called and Moon opted to check. The flop came , Moon check-raised to 375,000 when Lewis bet 100,000. Lewis called. They both checked through the on the turn to the on the river on which they both checked again. Moon tabled for the missed straight draw. Lewis showed for the flopped pair of tens and the pot. Hand #81: Benjamin Moon opened to 160,000 and Romain Lewis defended. The flop came down and Lewis check-called a bet of 150,000. Both players checked down an run out and Lewis claimed the pot with the . Hand #82: Lewis limped and Moon checked to see a flop. Two more checks saw the on the turn and another two checks brought the on the river. Lewis bet 310,000 and Moon check-folded. Hand #83: Moon opened to 200,000 and folded to a three-bet jam from Lewis. Hand #84: Lewis limped in and called a raise of 160,000 from Moon. An flop was dealt and each player checked to bring the on the turn. Moon fired 250,000 and Lewis called. The completed the board and Moon took down the pot with a bet of 450,000. Hand #80: Romain Lewis limped in from the button and Colin Robinson opted to complete his small blind. Benjamin Moon checked his hole cards and decided to check in the big blind. The flop came , Robinson checked, Moon bet 150,000. Lewis considered his options for a bit and then called. Robinson glanced at the board once more and then decided to shove for about 1,300,000. Moon called and Lewis quickly got out of their way. Robinson had flopped a flush draw and gutshot straight draw. Moon, on the other hand, he had flopped top two pair with queens and sixes. The turn brought them the , Robinson needed another diamond or a seven to stay alive but the on the river wasn't that and Robinsons was eliminated in 3rd place for $138,938. Hand #74: Benjamin Moon got a walk. Hand #75: Moon raised to 160,000 from the small blind and Romain Lewis shoved for 1,210,000 and Moon folded. Hand #76: Lewis shoved from the small blind and both Colin Robinson and Moon folded. Hand #77: Robinson completed his small blind, Moon raised to 200,000 and Robinson folded. Hand #78: Moon raised to 160,000 from the small blind and Lewis shoved in the big blind. Moon folded. Hand #79: Moon raised to 160,000 from the button and the two other players folded.